There are no photos with those IDs or post 23942 does not have any attached images! This year the IV edition of the Way of the Cross of Infiesto, which in previous years has been reaping an increasing number of visitors. 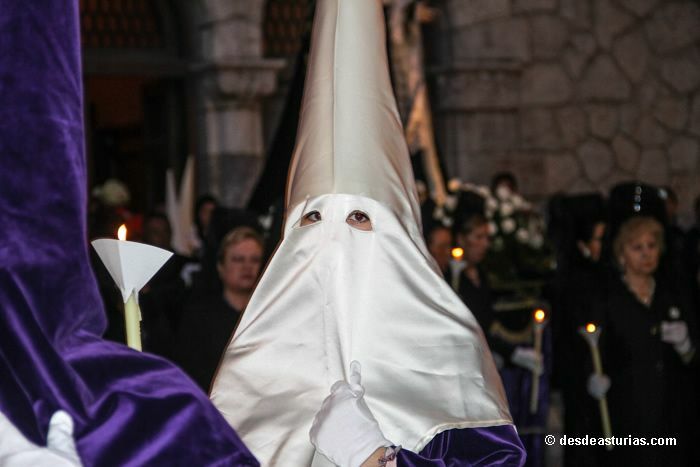 Below we detail all the acts of the Holy Week in Piloña. 19: 00 h. Mass. Next: Solemn Via Crucis in the Parochial Church. 12: 30 h. Blessing of bouquets and palms, in the Plaza del Ayuntamiento, procession and Holy Mass. 19: 00 h. Mass in memory of deceased brothers. 18: 00 h. Mass of the Lord's Supper. 19:00 h. Staging of the Last Supper and washing of the feet. 20: 00 h. Prayer of the garden. 21: 00 h. Procession of the Nazarene. 23: 00 h. Holy Hour in the parish church. 07: 00 h. The sailing turns to the Blessed Sacrament. 16: 00 h. Celebration of the Passion of the Lord. 18:00 h. Via Crucis living in the streets of Infiesto. 09: 00 h. Procession of Silence, then Mariana Celebration. 21: 00 h. Easter Vigil. 12: 30 h. Holy Mass, celebration of the Easter of Resurrection. In the House of Culture Marqués de Vistalegre de Infiesto you can see the sample of photographs belonging to the third edition of the Via Crucis, held last year. Its authors are local photographers Inés Corral and José María Aladro. You can visit until the next 17 in April, per week, during the hours of the day from 11.00 to 13.30 and from 16.30 to 20.00 hours. 2 answers to "Holy Week Infiesto 2017"